If you want the look and feel of hardwood floors, but none of the hassles that go with them, vinyl plank flooring can be great option. Vinyl plank flooring has all of the design benefits of real hardwood floors, but it is more durable, easier to clean, easier to install and a fraction of the price. 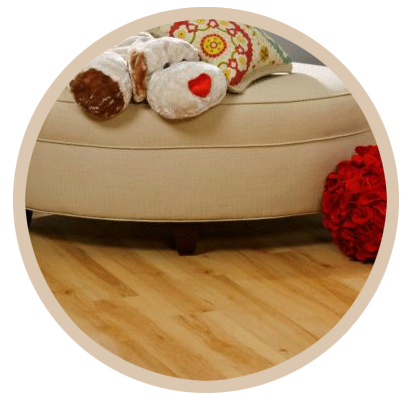 Vinyl plank flooring is extremely durable and resistant to scratches and stains. It's a great choice for heavy-use areas such a child’s room, family room, or rec room. Additionally, vinyl plank flooring is water-reistant and very easy to clean. This makes it a perfect choice for areas that are prone to spills and moisture such as kitchens, bathrooms, laundry rooms, mud rooms, and basements.